Nutritious meals prepared by skilled chefs that can be delivered to your door. Maine-ly Delivered Meals can be delivered according to your individual needs, benefiting the person's needs as well as the caregiver. Prepared meals are easy to heat, nutritionally balanced and delivered to your front door. Our delivery drivers also provide a safety check. Are Maine-ly Delivered Meals right for you? Do you not qualify for Meals on Wheels but want a home-delivered meal? Are you currently on a Meals on Wheels waitlist? Have you been discharged from the hospital or a skilled nursing facility and need meal service to assist in your recovery while you maintain independence in your own home? Contact your local Nutrition Coordinator to inquire about starting Maine-ly Delivered Meals today! Grocery shopping and cooking may not be easy for many older adults, but our Maine-ly Delivered Meals offer the opportunity to ensure that they will have fresh, wholesome, delicious meals—free of preservatives and artificial ingredients and naturally low in sodium, saturated fats and sugar—delivered right to their door. Our meal delivery provides the necessary calories, vitamins, minerals and other nutrients older adults need, in the right portion sizes. 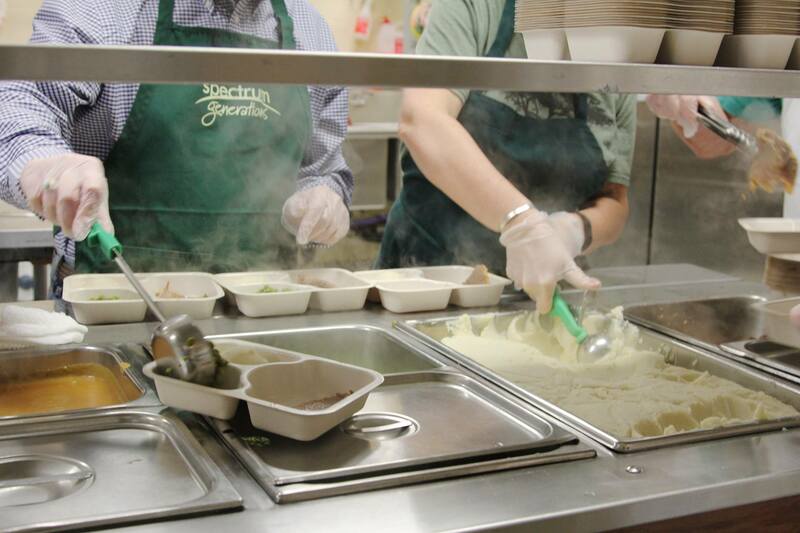 Our meals offer recipients nutritional balance and proper caloric intake through a variety of in-season fruits and vegetables, whole grains, and lean proteins. Our meals provide peace of mind for the whole family, knowing that each week their loved ones can have complete meals delivered right to their door. For over four decades Spectrum Generations has been a Meals on Wheels provider, uniquely positioning us to be an expert in nutritional content and delivery of food to our neighbors.